Not to be to picky. The refflinghaus 460lbs with 2 upsetting blocks should bring it close to the 490lbs mark..
With (2) 1" hardie holes.. This would be the ultimate for myself. I'd be surprised if Centaur let you keep the reject anvil. If you want reliable results send it to a heat treater and the least you'll find out is if the problem is the factory heat treat or the alloy. Soderfors broke the mold out after a specific time and placed the anvil under a water flume, originally a water tower, and let a specific volume of water of specific temperature flow on the face for the specified time. According to the article as I recall they had exact numbers for everything accounted for air temp and variables they didn't specify. My thought was to set up a cut down 55gl drum "forge" to heat the ASO to hard silver soldering temp. Pull it and shine up the surface with a disk sander, apply the flux and silver solder. Then wire the HC steel plate in place and return it to the fire. When the solder sweats at the edges start timer on the soak. Then remove the anvil from the fire with my engine hoist and place it under the water hose. By water hose I mean the outlet hose from a rented 2" trash pump. The water hose would be suspended vertically from ladders or whatever held it securely. The intake is from "Lake Jake" the really large pond in the decommissioned gravel pit down the hill from us. Jake's a friend and neighbor so permission would be as easy as asking. Anyway, that's it. Once the solder sweats the anvil face gets a cold water drench at 200gl/min. Occasionally stopping the flow to check the anvil temp. When adequately quenched give the face a quick pass with the disk sander and observe the temper colors run and stop the temper by turning the pump back on. NO, I've never done this but that would've been my starting technique using a currently pretty useless abandoned ASO and one of those pieces of 1" thick Vascowear laying out there by the shop. I brought those home as we had to trim the second segment to fit a couple of our smaller graders. For the time and outlay it's be cheaper to buy a new anvil. The time spent heat treating one could be used more economically making trinkets for sale. Ha! MY first ASO was a Vasco wear plate! I like your project idea! Ambitions!, you HAVE to make a video if you do it! AS soon as He said that I went out and lit the forge and making some things to list on Etsy for the first time, Santa Fe it was a lot easier to just find someone who wanted something for their old adobe house, last one I made a bunch of heavy curtian roda and hangers that would hold in the 'Mud' as well as a lock spring for the original lock in her house. I plan on making some things for the Master Gardener class here too, hopefully spark some interest. wish me luck! By the way, I keep hearing something I'd never heard in the past and that is that anvils "Work Harden" I might be a idiot but I do know my Metallurgy pretty well...if anything HARDENED-steel -doesn't harden more striking it but it becomes more likely to chip over time. Maybe this is something the internet and all the new Ductile Anvils made but I don't remember ever reading that your anvil gets harder with use in the old books either. Sounds like the replacement anvil is coming faster than expected? It's not like it's coming from Turkey you know and I'm sure they'd like this taken care of soonest. Work hardening... Image an annealed steel. All of the atoms are aligned in a lowest energy arrangement. That is why the steel is soft. When you apply a force (or "stress") to the steel, it deforms -- this is called strain. Up to a certain amount of stress, when you remove the stress, the strain goes away. This kind of strain is called "elastic strain." Think "rubber band." After the certain amount of stress (which depends on the material and condition), any further strain remains permanent. This is "plastic strain." Plastic strain happens when those atoms arranged in their lowest energy arrangement start moving relative to each other (called "dislocations," there are different kinds but don't worry about that). The atoms then are not in a lowest energy arrangement. This extra energy from this new arrangement now makes it harder for the atoms to move again. Now the stress needed to make the steel strain elasticity increases. This is work hardening. You can repeat the above until enough dislocations line up and the steel breaks. To reset the steel (before it breaks! 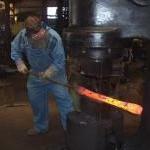 ), just anneal it. This gives the atoms enough energy to move around (i.e. "diffuse") and get comfortable (get in the "lowest energy state") again. Summary: to work harden your anvil, you will have to deform it. Your anvil should already be hard enough that you are not deforming it, and therefore work hardening it, with hammer blows. Simplistic explanation: Hardness is resistance to deformation. Deformation is layers of atoms slipping past one another. Dislocations are basically like putting in speed bumps that impede layers of atoms slipping past each other. As force builds up and deformation can't/doesn't happen rupture may. Heating the material above the dislocation climb temperature allows the dislocations to "heal". Been about 42 years since that MatSci class; I still have the textbook though. Summary: to work harden your anvil, you will have to deform it. That's what I get for posting after bedtime. I was imprecise here. I should have said that you will have to plasticly deform the anvil -- i.e. deform permanently. It is good to see that Centaur and Kanca are resolving this nicely! Now I can rest assured and go ahead and order my first decent anvil. My 55 pound cast iron is working adequately for minor things for now, but very much looking forward to a 110 pound Kanca. I agree! Yeah go ahead and get one, even though mine is soft it's still far more durable than a cast iron one, I started with a 55 pound cast iron anvil as well and the difference even with another fairly soft anvil I got after that was HUGE , You get double the work done per hammer blow when the anvil doesn't dent like cast iron but all that energy goes into the work piece. I asked the rep to share a video of the forging of these anvils, hopefully he does this. Yeah!!!!!!!!!!!!!!!!!!!!!!!!!!! Great day indeed.. Now we can say congrats.. I will be really curous as to which give/gave you better forging results.. It's great Kanca came thru.. Peddinghaus (Rigid) I heard was absolutely a chicken on it's head kind of affair.. I'm so excited for you..
4/2 I bought a new computer.. 4/5 the sound card died.. 4/6 I sent it back.. Here we are 4/20 still waiting to get a replacement.. Going to be the 22nd before it arrives.. I think your problem was resolved way sooner and more betterer than mine..
Yeah this just goes to show Kanka takes pride in their anvils, it didn't take a whole lot of effort to get this replaced and it happened very quickly all things considered...I'm pretty sure the harder anvil will get more work done as more energy is transferred into the work as opposed into the anvil. Should I start another thread just to review this anvil? I'd like to do my part to help others here to make the decision and help kanka for the excellent customer service they provided.